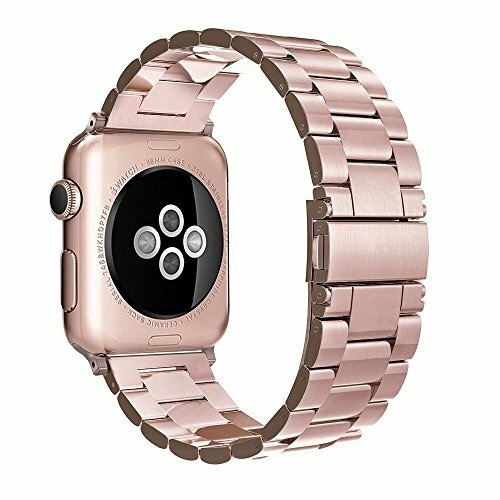 Colorful: There are 4 colors including space gray, silver, champagne gold and rose gold available. No matter you are a business man or a trendsetter, this watch band will show your style. 1.The product is only the watch band, apple watch is not included. 2.To resize the band, please refer to the Instruction in the package or the last picture in the listing. It should be done by technical skill with a moderate force, if you haven't done this job before, we suggest you to bring it to a jeweler to have it sized. 3.Please make sure the connector is not installed backwards, or the connection is not firm enough and easy to fall out. 4.Any further assistance is needed, please feel free to contact us, we'll be glad to solve your concerns. （1）Go to the product listing on Amazon and click the third-party seller's name. Click Contact the seller under Further Information. （2）Go to Your Orders, find your order in the list, and click Contact Seller. 5. Links removal tool comes as a gift so that the quality is no match for professional tools, which is needed if you adjust the band frequently. 2.Safe and easy to wear: This watch band is designed with dual folding clasp, which can be firmly wore and easy to take off. Please take this band off when do the outdoor work,Avoid friction. 3. Change watch band within 10 seconds: We adopted fine steel connector which perfectly fit your Apple watch. You are able to change the band anywhere anytime- JUST FIT FOR APPLE WATCH BAND 38MM, NOT FOR 42MM. 4. Adjustable band length: the band comes with removal tool which makes you possible to adjust the band length to your wrist. Up to 6 links can be removed, 8 mm/ piece, around 100g/pc. Suitable for 6.1-7.8inch（155-200mm） wrists size. 5. Worry-free after-sales service: We provide a 5 years warranty and free lifetime technical support globally. You can get an exchange or refund if your band has any quality issues within 5 years.